There are many things to be thankful for when it comes to fire departments and the men and women who put their lives on the line to be heroes every day. When Molly and I were living in Madison, we were awoken to a house fire across the alley. We were sincerely grateful for the Madison Fire Department for ensuring the safety of the students who were living there and by preventing the fire from spreading throughout the neighborhood. While they may not have to bring a cat down from a tree each day, I guarantee you that fire departments across the country make differences big and small for the citizens of their community daily. A bit selfishly, I'm also thankful for the photographic opportunities that fire fighters and fire trucks provide. 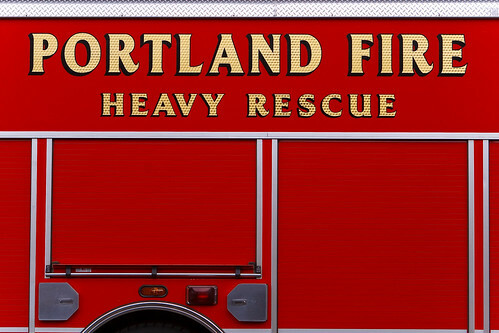 While walking along the Eastbank Esplanade, I came across a fire station with a Portland Fire Department Heavy Rescue vehicle parked outside, freshly cleaned, deeply red, and shining on every metallic exterior accent. And while I was struck by the side of the vehicle, I was astonished by the ornament on the front of the truck. 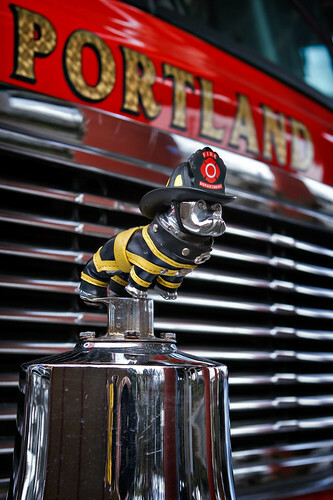 After walking around the truck, I noticed a fully dressed metal fire dog atop a fire bell on the front bumper. I just couldn't wait to snap 15 or 20 photos of this poised canine. And a final shot of the dog on the bell. I like the landscape orientation better, but this is a fine representation too. My dad worked for Pierce (firetruck manufacturer) for many years, so my brother and sister and I got to ride in them in parades as kids and honk the horns :) Nice pics! 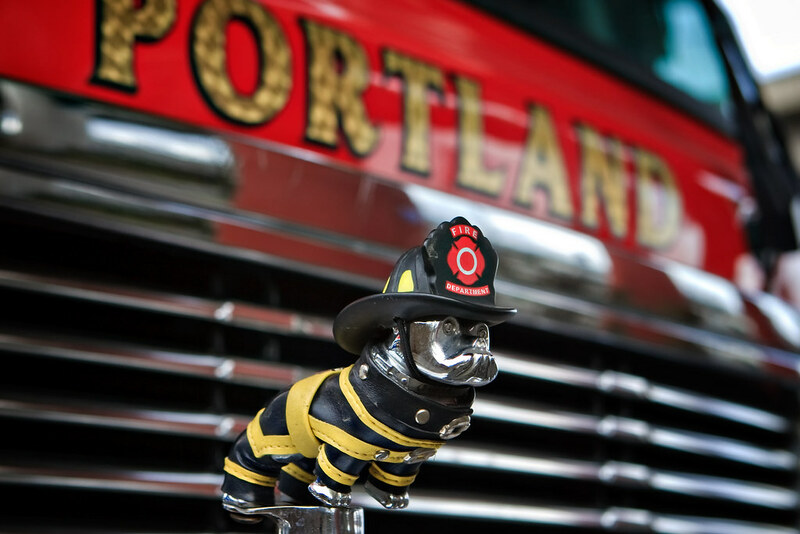 love that little red fire dog!